Here are the answers to some FAQ's. If you can't find the answer you need (or just don't want to spend time reading) phone or email us for more information. When I send my cylinder for repair, what do I need to send with it? All that we actually need is the cylinder, but it is good if we get the piston too so that we can be sure to give you the correct clearance. Remember also to include a note of your name, address, daytime phone number and any special requirements. Do I need to take all the studs and the power-valve out before I send it? When we process cylinders, we usually need to immerse the whole thing in some strong chemicals that will eat materials like steel, brass and so on. Because of that, we like to have all of those materials removed before we start work. Sometimes, parts are cast into place during the manufacturing process and they are impossible to remove. In that case, we will paint a protective lacquer on those parts to try to prevent any chemical attack. YOU MUST UNDERSTAND that while we take all reasonable steps to avoid damaging parts when we process cylinders, we will not accept any responsibility for any damage that does occur. I did not write that last bit, what it means is that damage may occur, but in reality the methods we use to protect these parts works very well. The parts that you should not attempt to remove are the power valve guide pins on some KTM, steel power valve bushes hidden deep in some Kawasaki and other cylinders. That said, if there is a head stud or some other part which must be removed before plating but seems stubborn we would prefer you left it for us to remove (or take it to a professional). It's a lot easier for us to remove a broken stud than to remove a broken drill/easi-out/tap after you have had a go yourself. But in cases like this the above paragraph does apply. Order a new part while we are repairing your cylinder because if you can't get the part out there is a fair chance it won't be much good by the time we succeed. What does it cost to get my cylinder repaired? We always try to keep our prices very competitive, and we are sure you will be pleasantly surprised at how affordable our repairs are. Please contact us for current pricing. How can I get my cylinder to you? We get deliveries from most carriers each day. They all know where we are so just pick the one that you feel most comfortable with! How long will it take before you can ship it back to me? When my cylinder is finished, how will you ship it back to me? We accept MasterCard, Visa, and debit cards (or business cheque from approved dealers). I'm a dealer - how can I qualify for a discount? request a dealer application - it's that simple and it will be dealt with quickly and efficiently! Why should I send my cylinder to you when I can get a sleeve fitted at my local shop? Why would you want to add extra weight to your machine, increase bore wear and lose engine performance? My cylinder already has a cast iron sleeve installed, but it's worn past it's biggest piston. Can you help me? Yes, Langcourt were the first to introduce nickel/silicon carbide plating onto cast iron many years ago. We can probably help solve your problem - just contact us for more information. How thick is the finished coating? 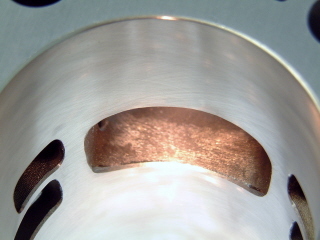 Usually about 0.004" (0.10mm). We can plate much thicker than that (and often do), but as the coating thickness increases, so does the edge buildup on the ports and lead-in chamfers etc. There are also technical reasons to avoid excessive thicknesses, and sometimes economic reasons to plate cylinders regardless of thickness. I had a rod break on my vintage racer and it went clean through the back of the bore. It looks like it's ready for the trash can to me, but I can't get a replacement from anywhere. I'm desperate - can you help me preserve my bike? Probably! We pride ourselves on the quality of our welding and machining of damaged bores, and if you have seen our literature before you will probably already know what we are capable of. Sometimes (rarely) we come across situations where we do not feel confident that any repair would offer satisfactory performance or durability, and we will tell you that upfront and let you decide how to proceed. The "skirt" on the bottom part of my cylinder broke off and I can't find it. Can you still fix my cylinder without it? Yes. Even if you have the broken part, we usually don't weld it back on because experience has taught us that building up a skirt from new metal is a better solution.